Rolling Stone has a terrifying feature up today detailing how Mike Pence fumbled his way into the second highest office in the land. 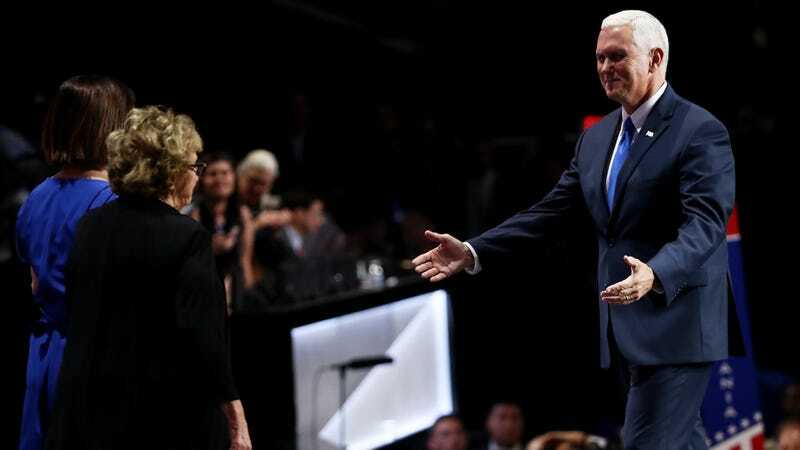 Although not nimble enough to remain popular even in conservative Indiana and too radical to get anything passed in the House of Representatives, Pence had the perfect amount of fundamentalist religious zeal to give the give the current administration an air of actual convictions. To Pence’s credit (kinda) the Deadspin staff agreed that it’s fine to call your spouse “mom” or “dad” to or around your kids (or pets). But that does not seem be the case in the situation described. And, moreover, the conversation as it’s transcribed brings up another issue: Even if he was speaking to the lady who birthed him, would it be weird for Pence to call anyone “Mother” to their face? I can say with absolute certainty that I have never called my mom “Mother.” I would sooner call her by her first name, and have, in a pinch. But not everyone shared my visceral discomfort for what is ultimately an accurate term and I’m perfectly fine with “mother-in-law”—although more in reference than address. So, what about you: Do you call the woman from whence you came mom? Mother? Mama? Mommy?! And you don’t call your wife “mother,” do you? Oh, also, my boyfriend freshmen year in high school called his mom “mother” once and my older sister badgered me about it until I dumped him.